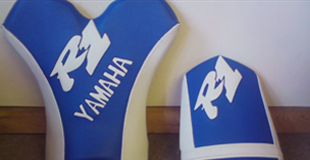 For that one of a kind personalised look to your motorcycle or scooter, look no further. Here at Viking Motorcycle Seats we provide a customised service for all seats. For the bespoke designs with prices that will suit your individual budgets, we can provide our service that can add brand logos, faux vinyl’s or any other designs you require. Our seat customisation service will have your motorcycle or scooter standing out from the crowd, as well as giving you a trendy and comfortable seat for you to enjoy. We can offer you a complete range of faux vinyl’s such as crocodile, elephant and snake skin, that can be tailored around you to create a bespoke motorcycle seat. Our friendly team are always happy to discuss your designs as well as provide you with professional advice, so that you can get the most out of your customised seat. For more information, please get in touch today. For your very own professional scooter seat customisation, get in touch with our experts today on 07977 874 075.